Day 101 of the SP… A grey day with light rain which always calls for an adventure. I found a monument in Duxbury, a town just to the south of us that is a memorial to Myles Standish.. It is not visited that much with the gates to the road/trail locked, as well as, the tower door. It sits upon a hill overlooking Duxbury and the Atlantic Ocean.. An amazing view for a monument with no one about on this early morning contrast less day.. Duxbury, Ma…. 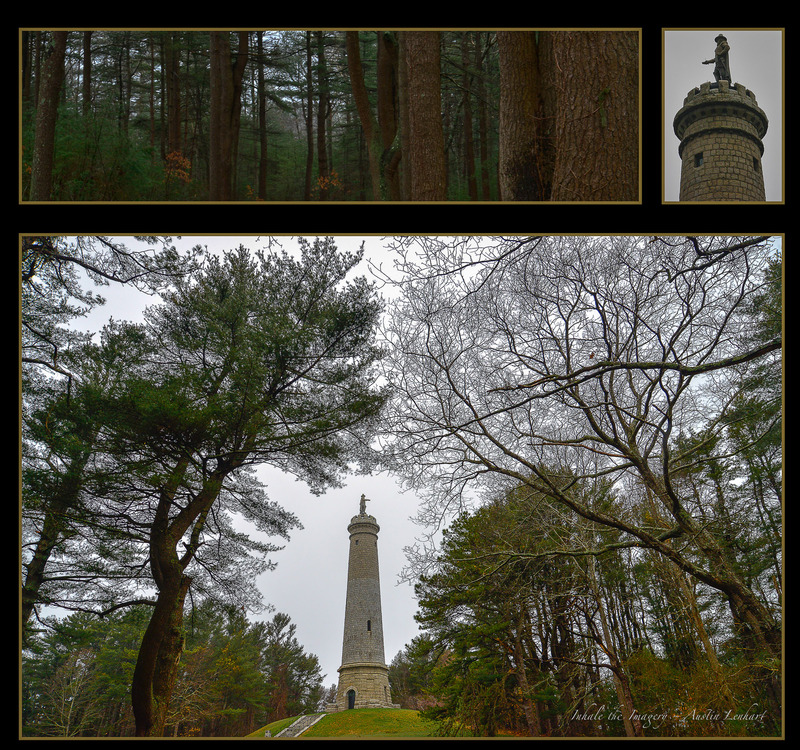 About the Park… “High atop Captain’s Hill, 200 feet above sea level, stands the Myles Standish Monument, a 116-foot granite shaft crowned by a 14-foot statue of Captain Myles Standish, military leader of Plymouth Colony. Begun in 1872, completed in 1898, and refurbished in 1988, the monument offers a panoramic view of the South Shore-church spires, several 19th-century lighthouses, the five-mile-long Duxbury Beach, Plymouth Harbor, and the Blue Hills off to the northwest. When the building is open, visitors can climb 125 steps to a small viewing area at the top, but even from the base of the monument the view is spectacular. Once cleared of trees and underbrush for farming, most of the park is now a lovely pine grove crisscrossed by walking paths”… It was quiet and smelled of pine.